Assisting Hands Home Care in Batavia, IL announced that it has received both the 2019 Best of Home Care® – Provider of Choice and Employer of Choice Awards from Home Care Pulse. These awards are granted only to the top-ranking home care providers, based on client and caregiver satisfaction scores gathered by Home Care Pulse. Our goal at Home Care Pulse is to empower home care businesses to deliver the best home care possible. Assisting Hands Home Care in Batavia, IL announced that it has received both the 2019 Best of Home Care® – Provider of Choice and Employer of Choice Awards from Home Care Pulse. These awards are granted only to the top-ranking home care providers, based on client and caregiver satisfaction scores gathered by Home Care Pulse. Assisting Hands Home Care in Batavia is now ranked among a small handful of home care providers across the country who have proven their ability to provide an exceptional working experience to employees and the highest quality care to clients. Best of Home Care providers have contracted with Home Care Pulse to gather feedback from their clients and caregivers via live phone interviews each month. Because Home Care Pulse is an independent company, it is able to collect honest and unbiased feedback. 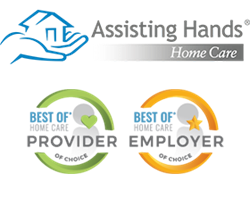 To find out more about Assisting Hands Home Care in Batavia and their commitment to excellence, please visit https://www.assistinghands.com/47/illinois/batavia/ or call (630) 332-2203. Assisting Hands Home Care in Batavia, IL offers clients personalized non-medical home health care services. Their caregivers provide home care assistance to the elderly, disabled or other clients who have special needs, such as Alzheimer/Dementia care, Parkinson’s Care etc. They can customize their in home care services to fit your schedule and your needs, whether you need a few hours of care per day or round the clock care. Call Assisting Hands Home Care in Batavia, IL at (630) 332-2203 for free consultation on respite care, overnight care, 24 hour care and live-in care. Home Care Pulse is the home care industry's leading firm in satisfaction research and quality assurance. On behalf of home care businesses across North America, Home Care Pulse gathers unbiased satisfaction ratings from clients and caregivers and detailed feedback to ensure the best in-home care possible can be provided. Powerful online reports allow businesses to identify needs and take action to reduce increase satisfaction, reduce caregiver turnover, and address client needs. For more information, please call Home Care Pulse at (877) 307-8573 or visit http://www.homecarepulse.com.